Fellow Seibertronian MaverickPrime, the one who keeps an eye out for any Transformers news coming from Mexico, has found loads of new Transformers toys. As with the US, the latest Studio Series voyagers Optimus Prime and Rampage were found but he also found the second wave of Siege Battle Masters, Aimless and Pteraxadon. This is the first sighting of these toys in North America. He gives us a breakdown of all his sightings including the price jump for Siege Leaders, which used to be $65 USD in the POTP line and have now increased to $75 USD in select stores. 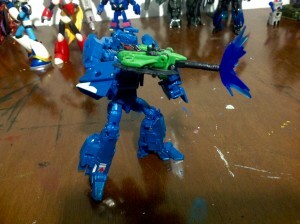 Also, for Pteraxadon, MaverickPrime has given us some in hand shots of the toy including action poses. With Mexican Kids' Day getting closer, Hasbro has begun giving us several new toys at retail, in Walmart, Warrior Class Hot Rod, Prowl and Soundwave, as well as Legends Class Shadow Striker, Ratchet, Starscream and the second Optimus Prime(Ion Attack or something similar). Meanwhile, Liverpool Department Stores got Cyberverse One-Step Wheeljack, which as far as I remember hadn't been mentioned anywhere, as well as Studio Series Rampage(Optimus most likely was there, but I couldn't find him), skipping all the way from ROTF Starscream to number 37! But the biggest surprise, was the finding of Battlemasters WAVE 2! I found Aimless and Pteraxadon! 3,797 pages were recently viewed by 565 unique visitors. This page was viewed 1 times on Thursday, April 18th 2019 5:42am CDT. © 2019 Seibertron, Inc. DBA Seibertron.com. All Rights Reserved. Established June 2000. Seibertron.com is owned by Ryan Yzquierdo.